I thought about ranting on it after the Test defeat in Sharjah. Mathews had just been baptised as the captain. So let’s wait, I thought. Then there was a glimmer of hope in Headingley, England. Mathews braved to Mankade Jos Butler and was found to be the chief architect of the bouts of sledging aimed at Joe Root. He is fast improving, I thought. Things became pear shaped again in the series against South Africa at home. The story would be extended to India in November and to Basin Reserve in January. The World Cup was another nail in the coffin for our fear to take the attack to oppositions. I hoped that the clouds of catastrophe would clear and our march in the right direction would be incepted in the post-World-Cup era, but the same old story continues. The ghost that was clambering on Sri Lanka’s back for some time reappeared both in Galle and Pallekele. I don’t want to take pot shots at any particular individuals, but it will be tough painting the whole picture of the current state of affairs of Sri Lanka cricket without making mention of Marvan Atapattu and Angelo Mathews. I do not intend to blame a few individuals to the gradual demise of our cricketing culture since the system as a whole has been responsible for the cultural genocide. But, truth be told, the destructive process has seen a sudden surge in catabolism, catalyzed by the combination of Angelo Mathews and Marvan Atapattu. Even though a captain or a coach cannot have a telling impact in the holistic performance of a team, I believe they will have a lasting influence over both the attitude and the culture of the team. History has rendered several lessons on how big an impact a good captain or a coach can have on the team. Australia’s sweeping recovery and the gaining back of their aggressive and ruthless vibes was catalyzed by the new coach in the office. On the other hand, England looks a completely different outfit with their new coach, Trevor Bayliss promulgating a “fight fire with fire” attitude. Bangladesh’s sudden escalation under Hathurusinghe and Zimbabwe’s will to fight sans fear instigated by Dav Whatmore, all prove one thing – an individual with a sanguine attitude and skills in personnel management can change the nature of a team even without changing a single member of a XI. Marvan Atapattu’s coaching stint has become an Alzheimer’s disease for Sri Lanka. I had my own reservations when Atapattu was appointed as head coach. But it had more to do with the fear of political influence that was likely to result than anything else. Never did I doubt Atapattu’s expertise as a coach. But, now I feel that Atapattu has not only failed as a coach but he has also been instrumental in usurping considerable power within the management of the team. He has become an authoritarian who lobbies the appointment and axing of coaching staffs, and an autocrat who jockeys team selections. It seems as if Atapattu had been eying the post of the head coach for a very long time, even before his name was pushed forward as a probable after Paul Fabrace’s defection. Geoff Marsh once said, “I think there was someone outside the playing group who was on tour wanted to coach Sri Lanka and he was driving a nail between us”. Marvan Atapattu was Sri Lanka’s batting coach on that tour . It is possible that he could have been that ‘someone’. It is easy to snub this comment as yet another sour, green eyed remark from an Australian. But, one important point to consider was that the comment was not something uncalled for. There was a news article suggesting that the seniors wanted to see the back of Geoff Marsh and Marsh was only responding to it by vindicating the seniors and exposing the real culprit. Sangakkara would soon take to Twitter to express his reverence for the sacked coach. Even when his name was thrown into discussion eventually in 2014, not many within Sri Lanka Cricket, including the former selector Sanath Jayasuriya, preferred seeing his acession to the helm of coaching. How much of an impact Atapattu’s brother-in-law and the then secretary of Sri Lanka cricket had on the tendentious appointment is a question. To make everything worse, SLC shirked both Chandika Hathurusinghe and Dav Whatmore. Our loss has become someone else’s gain as the recent results conspicuously suggest. The worst thing to have happened during Atapattu’s tenure was the axing of Sri Lanka’s fast bowling coach, Chaminda Vaas. Despite having done a remarkable job with the fast bowlers, the administrators found fault with his coaching after that abominable tour of India. The continuously failing batting, however, was completely ignored for some reason. Things escalated soon after the series defeat in New Zealand when Atapattu came forth about his disappointment on Chaminda Vaas. Soon, Vaas would be treated like a school kid and a chaperone would be appointed for him. After the World Cup he was demoted to coach the under-19 team with an embarrassing salary package – an offer which he refused. Whose gain this loss is going to become would soon be answered. It is also worth mentioning that Atapattu came in as a no-frill option. He was the cheapest option available for a financially ailing board. Hence, as to how the board agreed to accommodate Atapttu’s demand for more benefits before signing his contract is a mooted construct. On the other hand, there should be no doubting the technical prowess of Atapattu. He is one of the best in the world to have mastered the science behind batting techniques. He was the mastermind behind Angelo Mathews’s rise in world cricket as a batsman and Dimuth Karunaratne’s coming of age in the opening slot. Atapattu has shown himself to be a poor man-manager too. Not everyone can be technically sound. But the former captain’s philia to shape shift each and every batsmen into technically scrupulous individuals has done more damage than good. Dinesh Chandimal goofed up his batting when Atapattu attempted to rectify the batsman’s predominant bottom hand. Kusal Perera at times was seen caught between aggression and moderation. Most of these youngsters have done well in the ‘A’ team even when the team toured overseas. The moment they come into the national setup, they flop. Has the difference in atmosphere between both these teams got anything to do with it? When asked about Kusal Perera, the ‘A’ team coach Romesh Kaluwitharana uttered the following: “For me he is something special. I was looking at him in a different way because he is very different to some of the players”. Such ability to recognize different individuals’ difference in needs has eluded Marvan hitherto. But these are merely my conjectures and there are no categorical evidences to substantiate my opinions. I will be happy if I am proven wrong. Mathews, meanwhile, has abused his apathy – which he uses to his avail when batting – while leading his side. Being calm and cool is different from being oblivious to obvious tactical blunders. He sometimes leads the side with the stringent patience of a customer care assistant. Mathews, should he be Dr. Bruce Banner would never turn into a Hulk. His patience has reached a different level, so much so at times you wonder whether he is training himself to be a shaolin monk. There is no doubt that he is the best batsman we have at the moment. In the shorter formats he is capable of making the XI as a specialist bowler alone. But his captaincy has been soddened by apathy, lethargy and insipidness. More than once has he let the game slip from Sri Lanka’s hands, thanks to his defensive, over-cautious approach. 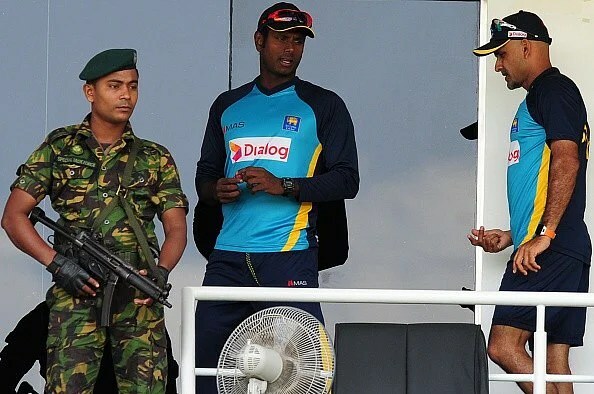 Against Pakistan in Pallekele on a pitch that was vivaciously assisting the spinners, Mathews opted for a defensive field to Sri Lanka’s only specialist spinner. It is true that Tharindu Kaushal was off line, but you know what you are after when you pick a spinner like Kaushal over Rangana Herath. In the domestic arena, Kaushal is notorious for his lack of accuracy but is known for his canny ability to pick up wickets with uncanny deliveries. Even when Kaushal was bowling well in the second Test, Mathews hesitated to attack. Only a short-leg and slip were in place when the rookie wrist spinner was wreaking havoc on the Pakistani batting line-up. The field setting was so laid back, that the relatively new batsman at the crease, Safraz Ahamed only had to dab the ball to the off to steal a single. It would be erroneous to state that Kaushal was ineffective in Pallekele. Probably the Pakistani batsmen had realized the peril of letting the youngster settle down and so they were eager to pounce on him on seeing him approach the bowling mark. But spawn among the full-tosses and over-pitched, off mark loopy off breaks were those sharp turners that spit barb at the batsmen. For a player like Kaushal, you can’t set a field for the loose balls he bowls. He was in the side as a wicket-taker and hence, Mathews must have made sure that his poison spitting balls do not go in vain. Younis Khan once during an over received an off break that spun square from way outside off stump to narrowly spin past his leg stump. It was clear that Younis was rattled. You could sense that the veteran was just about to do something silly to put the rookie off his comfort zone. Mathews could have exploited the situation and brought in an additional close-in fielder to add further pressure. Test cricket is always about the mind games and the Sri Lankan captain flunked an opportunity to get into the mind of the Pakistani stalwart. The Sri Lankans strictly adhered themselves to the path of non-violence and Younis Khan stepped out to hammer Kaushal over mid-wicket. It wasn’t hit well, yet it had enough to go to the boundary. Had more pressure been exerted, it could have made the shot even worse and could have possible resulted in a wicket. The oohs, aahs, aiyoos, niyama daapangs and niyamais by the close in fielders when a spinner is spinning yarn around batsmen have become relics of the bygone era. Four times in a short span we have lost Test matches which we must have won. In ODIs, our laid back attitude has teams use our bowling attack as punching bags. Our batting poses the least threat to bowling lineups among the top nations. 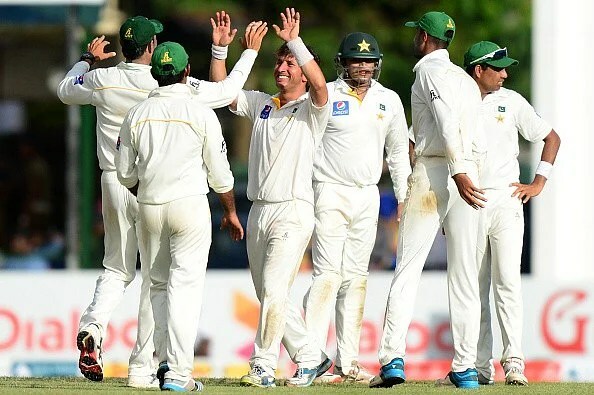 It is said that the Sri Lankans found Yasir Shah difficult to tackle. But throughout the series, it wasn’t his big leg breaks, or unreadable variations that troubled the Lankan batsmen. It was the field that was set for him that accounted for the wicket of the Sri Lankan batsmen. In many instances, the Lankan batters were forced to play a loose shot to relieve the pressure that was mounting. Thirimanne in Galle and Pallekele, Mathews, Dimuth Karunaratne and Jehan Mubarak in Pallekele, all fell to the surging pressure due to the drought of runs. In contrast Sri Lanka could not inflict the same on Pakistan even when Herath was bowling accurate spells guided by laser. Singles were always on offer and batsmen didn’t need to get out unless they became bored of batting and needed to return to the air conditioned dressing room to avoid the scorching sun. You can’t win Test matches by waiting for batsmen to make mistakes. It is no brainer that the Sri Lankan captain is tactically brittle. The only tactic he knows is to bowl short at the batsmen. Such was the predictability of his tactic that even the tail end batsman, Zulfiqur Baber was able to duck even before the ball was bowled. Mathews has shown signs of aggression and improvement in patches. We can only hope that Mathews improves as a captain since he seems to be the only youngster with a guaranteed place in the side. The Sri Lankan fans’ only option for the time being is to count the number of days for the expiration of Marvan Atapattu’s contract so that we can try our luck with a new coach, hopefully with a new approach.